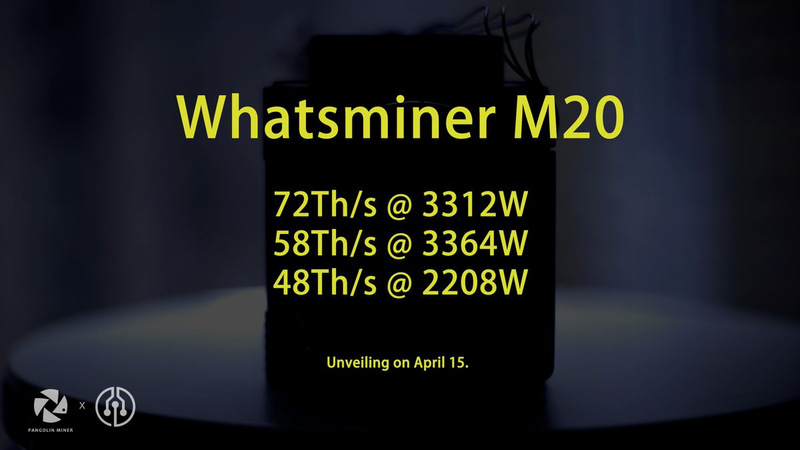 The MicroBT WhatsMiner M20 is a 12nm ASIC Bitcoin SHA256 miner with integrated power supply ad available in a M20V1 version with 48 THS hashrate with 2200W power usage (46W/Th) and 2500W integrated PSU available for $1450 USD, an M20V2 version with 58 THS hashrate with 3364W power usage (58W/TH) priced at about $1500 USD and M20S model with 72 THS with 3312W of power usage (46W/Th) available for $2160 USD. The provided integrated power supplies are apparently only 220V, so this could be a problem for use in some countries where different voltage for the power is being used such as USA! Looking at the specifications it seems that the M20V2 version is most likely an overclocked variant of the V1 as it delivers higher hashrate, about 10 THS more, but at higher power consumption and worse efficiency. Thus the price difference between the two devices is not that big as most likely only the PSU is changed with a more powerful model in order to be able to handle the extra power usage. The top model M20S with 72THS has the same power efficiency as the standard M20V1, so apparently it has more chips running at the same operating frequencies and voltage as on the smallest model, however any additional significant overclock of this model may not be possible as the power supply shipped with the device may be already close to its maximum specs. Cerium is a chemical element with symbol Ce and atomic number 58. Like the rare earth element it is named after, the Cerium (XCE) crypto currency is small in supply and aims to be a something the world depends on. Cerium hopes to introduce an efficient payment method which will eventually be adopted by the masses. No mining pools available as PoW ended, PoS phase is active now. Yet another SHA256-based alternative crypto that you might be interested in checking out.